What is Cavern Tavern like? 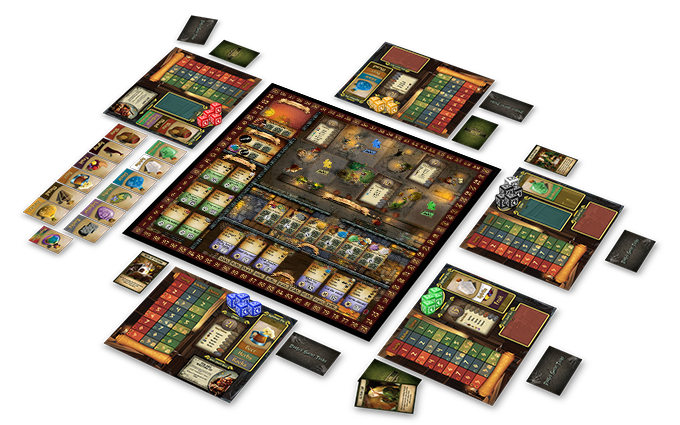 Cavern Tavern is a worker placement game, with the “workers” being dice rolls. Depending on where you place the dice you get specific ingredients, and sometimes, points. Once you have collected enough ingredients, you can finish the drink and deliver it to the patrons. The faster you do so, the more points you earn,… unless you are so late that the patrons have left. Not a good sign! At the end of the game, marked by the clock, whoever has the most points wins. Each player also has a secret goal that can heavily alter the score at the end of the game. Rounds are fairly simple: advance the clock, get penalized if you have an open order, pick a new order if you don’t have an open one, roll dice, and take turns placing one or more dice on one slot on the board to collect resources. Dice can be combined to reach higher values (which reduces the amount of actions you can take), but slots are limited, and you might find yourself locked out of an action. There are 4 kinds of actions: collecting ingredients, doing chores, working at the kitchen, and special actions. Collecting ingredients nets you ingredients. The chores or the kitchen tasks give you ingredients as well, but they also advance their respective tracks and give you a small amount of points. Some also let you trade or steal ingredients. The more you advance on either chores or kitchen actions, the more points that kind of action (either chores or kitchen, they are separate tracks) will give you. Advancing on those tracks eventually lets you modify dice results. Special actions give you items, let you change orders or modify the third track: the penalty track. Having an open order at the start of the round or someone else using that same action will advance you on the penalty track. Every few spaces on the track you get a mandatory task. 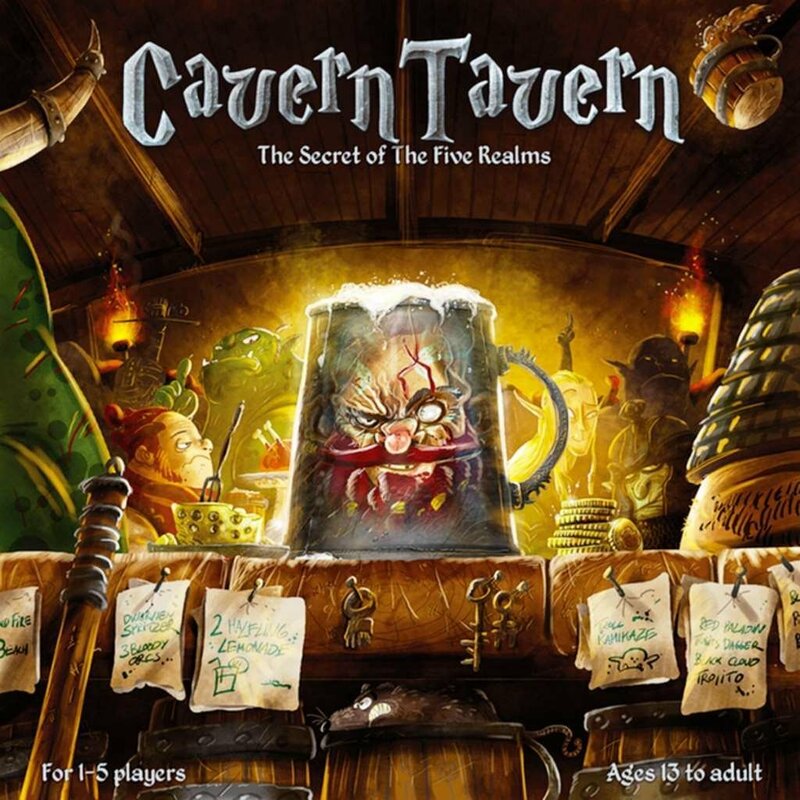 Cavern Tavern is a solid game on its own, with a fun theme and suitable for both interaction-heavy groups and groups that prefer each player do their own thing. The main gripe I have with the game is the amount of variance. While modifying dice rolls is eventually possible, most of the time you are very restricted in which actions you can take, and a couple of bad rounds can send you on a downward spiral. Variance is also present in other areas of the game: secret goals, mandatory tasks and items all have wildly varying power levels. Which leads to moments where the player is not in control; and they happen more often than I would like. The game could also use a smaller list of ingredients. A list of 13 different ingredients is unwieldy during both setup and gameplay, and makes it so there is no friction on the limited spaces to gain those ingredients. The game is pretty straight-forward. There is a degree of planning, but easy to comprehend.